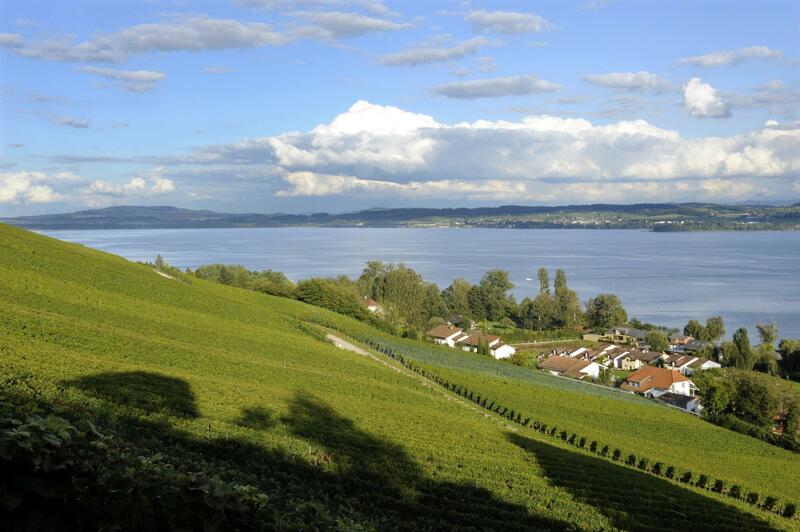 A land of vineyards and nature in the heart of the Trois-Lacs region, Vully is an oasis for ecotourism enthusiasts. With typical fine foods, unspoilt landscape and beautiful countryside walks, Vully-les-Lacs has all the elements of a perfect ecotourism destination. In the heart of the Trois-Lacs region, the delightful town has stunning views of the vines, lakes and alps. Small but well-known, the Vully AOC wine region is a paradise for leisurely luxury holidays. Wine-makers enthusiastically welcome individuals and groups into their wine cellars and there is a variety of marked trails for walkers or cyclists. In Vallamand, the little Musée de la Tonnellerie et du Vin tells the story of five generations of artisan wine-makers. The Caves Ouvertes (during Whitsun) and the Balade Gourmande de Vully-les-Lacs (3rd Sunday in July) are opportunities to sample Vully’s fruity, sparkling wines, as well as the region’s different culinary specialities, including the famous gâteau à la crème.